Who invented Peanut Butter? 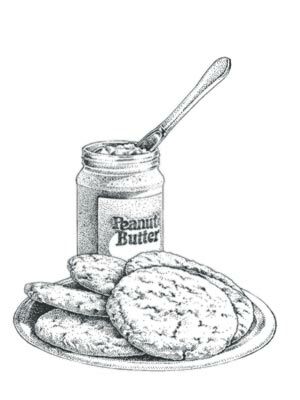 The name of the person credited with inventing Peanut Butter paste is Marcellus Gilmore Edson (1849 - 1940). Marcellus Gilmore Edson is not only famous as the Canadian inventor of Peanut Butter but also as a pharmacist and businessman. When was Peanut Butter invented? Marcellus Gilmore Edson invented Peanut Butter paste in 1884, during the Second US Industrial Revolution / Victorian period of invention (1850 - 1914). The invention of Peanut Butter paste originated in Canada and is considered a useful and nutritious addition to the field of Food and Drink. Definition of Peanut Butter: Peanut Butter is defined as a spread, or paste, made from ground roasted peanuts with a small quantity of water or oil, and commonly served as a relish on sandwiches. Peanut butter provides a source of protein, vitamins B3 and E and magnesium. Fact 1: Who invented Peanut Butter? Contrary to popular belief the black American inventor George Washington Carver (c. 1860 - 1943) is often mistakenly credited with the invention of peanut butter, although he certainly was an innovator of peanut cultivation. However, Marcellus Gilmore Edson was the first to patent the product. Peanut flour already existed at the time of the invention. Fact 2: Who invented Peanut Butter? Long before the arguments surrounding the invention of Peanut Butter surfaced the people of Mesoamerica were enjoying products made form peanuts including the Aztecs, Mayans and Incas. Fact 3: Who invented Peanut Butter? Peanuts are native to South America that originated in southern Brazilian as the plant (Arachis hypogaea) and became cultivated across the tropical South American continent. The Aztecs, Mayans and Incas used the edible nutlike seed of the plant for food and as a source of oil. The Aztecs version of Peanut butter was derived from roasting and mashing peanuts into a paste. Fact 4: Who invented Peanut Butter? Peanuts spread to the United States, Europe and the rest of the world following the colonization of the 'New World' and were subsequently cultivated in hot, tropical climates. Portuguese traders took peanuts from South America to Africa and even China where they were cultivated in Chekiang Province by 1573. Fact 5: Who invented Peanut Butter? Modern Peanut Butter was invented by Marcellus Gilmore Edson in 1884 during the Second US Industrial Revolution era of inventions (1850 - 1914) which was a nutritious addition to the area of Food and Drink. Fact 6: Who invented Peanut Butter? The inventor of Peanut Butter, Marcellus Gilmore Edson, was born on February 7, 1849 in Bedford, Quebec, Canada and died on March 6, 1940. Fact 7: Who invented Peanut Butter? The early years of Marcellus Gilmore Edson were spent in Bedford, Quebec, Canada where he was raised by his family. Marcellus Gilmore Edson received a good education and trained as a pharmacist. Fact 8: Who invented Peanut Butter? Following his education his first job was as a druggist. He enjoyed mixing the ingredients for various prescriptions and applied his skill to creating a nutritious paste using peanuts. Fact 9: Who invented Peanut Butter? Marcellus Gilmore Edson filed a patent application that was issued on October 21, 1884 patent number 306727, which he entitled “Manufacture of Peanut-Candy”. Fact 10: Who invented Peanut Butter? His invention of Peanut Butter was described as "a new manufacture of peanuts to form a flavoring paste". Fact 11: Who invented Peanut Butter? Marcellus Gilmore Edson described the process as milling roasted peanuts into a semi-fluid state between heated surfaces. When it cooled Edson described it as "a consistency like that of butter, lard, or ointment". His patent for peanut butter explained that candy or sweetmeat (a sweetened delicacy used as a preserve or pastry) could be created by mixing seven parts of peanut butter paste with seven parts of sugar. Fact 12: Who invented Peanut Butter? His patent clearly describes the initial steps necessary for the production of peanut butter. However, there is no evidence that Marcellus Gilmore Edson made or sold peanut butter or a candy derivative as a commercial product. Fact 13: Who invented Peanut Butter? In 1903, George Washington Carver began his research into the value of peanuts at Tuskegee Institute in Alabama and went on to develop more than 300 other uses for peanuts. Fact 14: Who invented Peanut Butter? In 1908 Krema Products Company in Columbus, Ohio, began selling the product and is the oldest peanut butter company still in operation today. Fact 15: Who invented Peanut Butter? In the 1920's George A. Bayle, the owner of a food products company, processed and packaged ground peanut paste as a nutritious protein substitute for people with poor teeth who were unable to chew meat. Fact 16: Who invented Peanut Butter? Dr. John Harvey Kellogg from Battle Creek, Michigan, began experimenting with peanut butter as a vegetarian source of protein for his patients. Dr. Harvey's brother, W.K. Kellogg, was business manager of their sanitarium, the Western Health Reform Institute. The Kellogg brothers went on to open Sanitas Food Company which supplied foods like peanut butter and cereals to local grocery stores. They went on to establish the Kellogg company. Fact 17: Who invented Peanut Butter? In 1922 Joseph Louis Rosefield invented a new production process which he licensed to another company to make Peter Pan peanut butter. Joseph L. Rosefield received the first patent for peanut butter that could stay fresh up to a year. Joseph Rosefield went on to market Skippy peanut butter in 1932 and went on to create the first crunchy-style two years later. Fact 18: Who invented Peanut Butter? Marcellus Gilmore Edson died on March 6, 1940 at the age of 91 years old. Fact 19: The United States is the third largest producer of peanuts, China and India are the first and second largest producers of peanuts. More than half of the U.S. peanut crop goes into making the famous paste. Fact 20: National Peanut Butter Day is celebrated in the United States and promoted by the National Peanut Board that works on behalf of all American peanut farmers. Fact 21: It takes about 540 peanuts to make a 12-ounce jar of peanut butter. The average American eats about 3 pounds of Peanut Butter per person per year. About 700 million pounds of the paste, in crunchy or smooth forms, are sold every year.